Public Mobile, one of the new entrants to the Canadian cell phone carrier space, announced today an unlimited music download service available to its customers using Android smartphones. Dubbed Siren, the Toronto-based firm is calling the service the first of its kind in Canada. The service is the second add-on service Public Mobile has announced this month. The budget cell phone services firm also unveiled Cash Services Aug. 7, offering its customers the opportunity to cash cheques, pay bills, transfer money, or buy a prepaid MasterCard while they are paying their cell phone bill. Siren will carry a library of more than 1 million songs at launch, from major record labels including Universal Music Canada, Sony Music Entertainment Canada, and Warner Music Canada. The library will quickly expand to more than 5 million songs, says Alex Krstajic, CEO of Public Mobile. Public Mobile announced Siren in Toronto’s Dundas Square. Siren is an app that can be downloaded to Public Mobile’s Android handsets. Music downloads can be done over a cellular network connection or Wi-Fi, directly to the phone’s external storage card. Introductory prices for the entry-level service plan that includes Siren is $40 per month, and $47 per month includes voicemail and unlimited Canadian long distance. Customers will need to access the music they download through Siren and maintain an active account with Public Mobile. “If you stop paying, your music’s there, [but] you can’t access it until you start paying your bill again,” Krstajic says. Public Mobile launched its cell phone network in May 2010, becoming the third new entrant into the Canadian wireless space after the 2008 spectrum auction. Its network technology is CDMA and in a frequency not popular among many cell phone manufacturers such as Apple’s iPhone. But paying less to acquire that spectrum has allowed Public Mobile to go after the low-end market of Canadians hesitant to buy a cell phone because of high handset prices or the need to enter into expensive contracts. Now Public Mobile has figured out a way to provide their customers with access to music on a mobile device, says Mark Goldberg, who runs a telecommunications consulting firm in Thornhill, Ont. 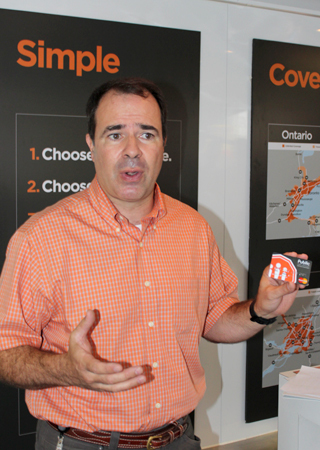 Public Mobile CEO Alex Krstajic shows a MasterCard acquired via Public Cash Services. The cash services now provided by the firm may not be a telecom service, but it is a convenience for customers, Goldberg adds. Public Cash Services are now available at 37 stores in Ontario and Quebec and also accessible online. Siren is supplied to Public Mobile by Livewire Mobile Inc., a Littletonk, Mass.-based firm that offers managed services for network operators, including mobile entertainment services and content portals. Public Mobile is offering a new Android device, the ZTE N860, as Siren Music ready. For $249 with a data plan, the phone offers Android Gingerbread 2.3, a 4.3-inch display, a 5 MP camera, and other standard smartphone features.